This home was a rental property with a rusty, leaking roof. With little maintenance done for the last two decades, the gardens, fences, house walls, windows and roof were in a bad state of disrepair. The clients immediately fell in love with the house and wanted to save it for future generations, while being somewhat daunted at the job ahead. The house is a large two-storey building of approximately 195 square metres with a separate single garage and carport on a large 1400 square metre section. The home’s original architectural drawings were done in 1928, commissioned by Mrs Quinn, a likely rare occurrence in those days as most homes were commissioned by men at the time. 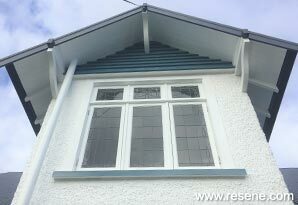 The house features Rimu, Matai and the most beautiful leadlight windows. It is now affectionately known as ‘Belmor’ which is a combination of family names but it also means tranquillity in Gaelic. The house sits on a back section and little can be seen from the road. The aim was for it to stand out but appear classic, as it should. 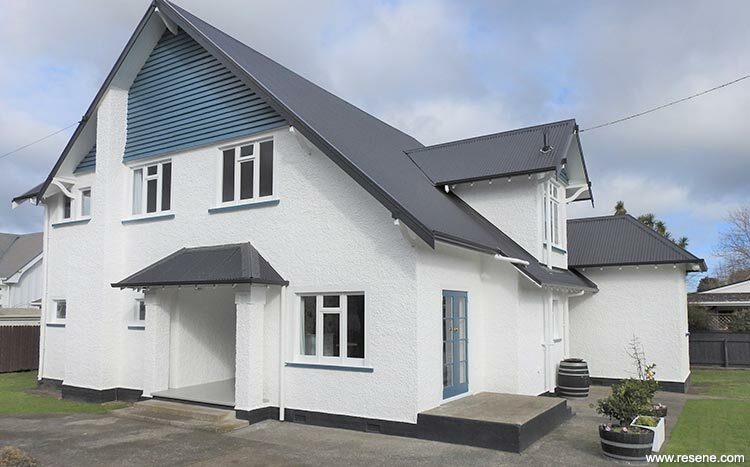 Certainly the comments from many people since painting the house indicate that the colour palette is just right. Sticking with tradition, white was used for the main exterior walls, with complementary colours from the Resene Heritage colour palette. The roof was replaced in long run (the previous roof was short run) in COLORSTEEL® Windsor Grey. This was used as a starting point to choose the Resene Cod Grey that has been used on the house and on the garage door and fencing. For the trim, we wanted something in the same hue as a heritage colour, but with more depth. Several colours were trialled before deciding that Resene Navigate was a stunning contrast to the white and Resene Cod Grey. Resene Walk-on in Resene Delta was used as a soft grey for the porch blending in nicely with the other finishes. Resene CoolColour technology has been used for the darker colours to minimise heat build-up. As with all older houses, there have been quite a few challenges along the way. Leadlight windows were leaking and had to be fixed, the overhead power cable to the house was hanging loosely and was about to break off so required a builder to fix it, there was lead paint galore, damaged masonry, asbestos to remove and rotten timber on some windowsills. Just the sheer size/height of the house caused a few headaches and an expensive investment in scaffolding. Gale force winds on many days halted painting, or meant painting could only be done on certain sides of the building. Then the rain came forcing a change in schedule. The outside of the home is now complete and attention has turned to updating the interior, being sympathetic to the way the house was and is meant to always be.